21 Mar What’s Your Sender Score? How to Improve Your Email Sender Reputation! You want your business to have a good reputation, and do everything possible to ensure it does. You’re ethical, deliver a quality product or service at a fair price, provide great customer service and donate to worthy causes. But what about your email sender reputation? You may be a winner in all the other departments, but a sinner according to your sender score. Learning what it takes to follow the righteous path can help improve the success of your email marketing campaigns. How did this come about? Julian Canlas of Mailjet chronicles its beginning in 1996. As business emailing became commonplace that year, so did spam. To counter this, large internet service providers (ISPs) offering email services began to use IP reputation to analyze email quality. This indicates how much users want to get email from an IP address by measuring bounces, spam or unwanted bulk mail (UBE). Simply put, an email sender reputation is a score that an ISP assigns to an organization that sends email. As SparkPost explains, the higher the score, the more likely an ISP will deliver emails to the inboxes of recipients on their network. Should the score fall below a certain threshold determined by the ISP, the ISP may send messages to the spam folders of recipients, or even reject the emails outright. According to Return Path, 83 percent of the time an email isn’t delivered, poor sender reputation is the reason. • The amount of email the organization sends. • How many recipients mark the organization’s emails as spam, and/or complain to the ISP. • How frequently the organization’s emails hit the ISP’s spam trap. • The organization’s inclusion on different blacklists. • The number of the organization’s emails that bounce because they were sent to unknown users or for other reasons. • The number of recipients open, reply to, forward and delete the emails, as well as click the links they contain. • How many recipients unsubscribe from the organization’s email list. The good people at HIPB2B caution that if your organization has a shared sending IP rather than a dedicated one, you may undeservedly have a low score because of the bad email practices of another business. Our March 26, 2018 blog post, “Why Your Business Needs a Custom Email Address,” covers the importance of a professional email account for budget-minded small businesses. A dedicated sending IP represents the next step in establishing the credibility you need to conduct the marketing campaigns necessary to grow your company. Fortunately, there are ways to protect and boost your sender score, with thanks to SparkPost and our other experts. The Messaging, Malware and Mobile Anti-Abuse Working Group (M3AAWG) provides a comprehensive document of email sender best practices for those who want mastery of the subject. Have authentication in place – Because spammers often masquerade as legitimate senders, email recipients look to authentication to see if the sender is really who they say they are. This is especially important when using an email service provider, as they may or may not be allowed to send on your domain’s behalf. There are four main protocols: SPF/Sender ID, Domain Keys and DKIM. Any reputable email marketing platform will make all available to their clients to help maximize delivery. Keep your email list up-to-date – Review your list on a regular basis and purge it of invalid emails and non-responders. High bounce rates can send your score downward, so keeping it clean will improve email delivery rates. Never purchase an email list from a third party – The numerous well-documented reasons for not doing so include the fact that it damages your sending reputation. Adopt an opt-in policy – In addition to being good manners, sending a confirmation email when users subscribe to your list ensures that the user’s email is valid, and that they actually want to receive your email messages. Implement an IP warm-up plan – If your IP address is new, IP warming is the process of methodically adding campaign volume week-over-week to establish a positive sending reputation with your ISP – which views email from a new IP address as suspicious until it establishes a positive sending reputation. Monitor the delivery of your email – Paying attention to bounce rates as well as response rates will help you identify potential issues. Pay attention to the subject line – A subject line that comes across as spammy pretty much guarantees your email won’t be opened, or sent directly into the spam file. Such words as “free,” “money,” “instant” and “sales” trigger spam filters. Provide high-quality content – How recipients interact with your email messages also affects your sending reputation. Give people a reason to open your email and take the desired action. If you’ve done your job in creating a message relevant to members of your target market, your email should produce results. Our June 1, 2018 blog post, “Nine Tips for an Effective Email Marketing Campaign,” provides additional details on achieving recipient engagement. If you don’t know what – if anything – is wrong, you can’t fix it. The following sites allow you to check your sending reputation. Keep in mind that no site directly measures a sender’s email reputation. Again, this is determined by the ISP. Sender Score – Enter an IP address or domain for a free partial report. 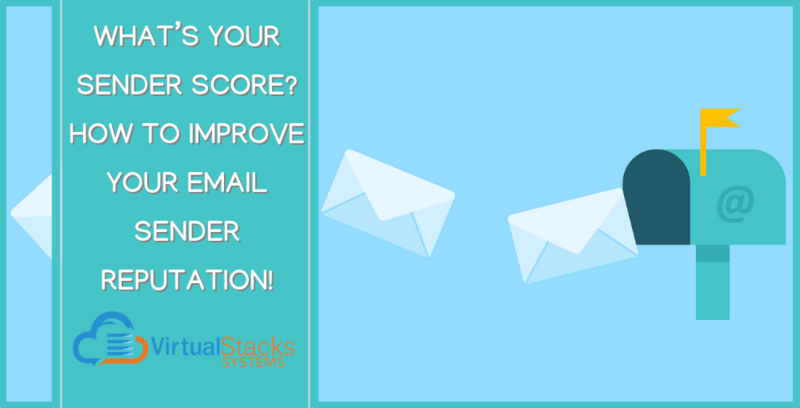 Registering for a free account allows full access to the Sender Score report, which measures your score from 0 to 100. ReputationAuthority – Enter an IP address or domain for a free report that measures your score from 0 to 100, and provides the percentage of good-versus-bad emails that you send. Talos – Enter an IP address or domain for an overview of your reputation, as well as access to threat-detection tools. Presented by Cisco. Your organization’s good reputation is its most important asset. Taking control of your organization’s email sender reputation is essential to ensuring that you live up to your guiding principles across the board, and continue to earn the respect – and business – for which you work so hard. Don’t sabotage yourself by neglecting email marketing best practices. As you can see, many elements go into implementing a successful email marketing strategy. Virtual Stacks Systems provides comprehensive email marketing and email hosting solutions for organizations of all sizes. Contact us to learn how a highly targeted, robust email campaign can help meet your goals.